Little impacts on how you look and feel as much as sleep. According to the National Sleep Foundation, the recommended amount of sleep that the average adult needs is 7-9 hours each day. For many, busy lives prevent us establishing a bedtime routine which could help us fall asleep quicker, and stay asleep for longer. Then, of course, there’s the other ‘sleep stealers’ such as caffeine, alcohol and the blue lights of gadgets and TVs, if consumed too close to bedtime. For others, the trickiest part is trying to actually nod off once their head hits the pillow. With sleep being a significant contributor to overall well being, and in celebration of World Sleep Day, we’ve selected five of our favourite products that’ll help you to relax, de-stress and have you counting sheep in no time. For more inspiration to help you achieve the perfect night’s sleep, visit our World Sleep Day page. 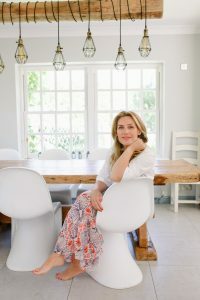 After noticing her wellbeing had taken a dive for the worst, former Glamour Magazine Editor Nicola Elliott gave it all up to train as an aromatherapist and nutritionist. She founded Neom Organics in 2005, running it from her two-bedroom Islington flat. Twelve years later, Neom is one of the most recognisable and best-selling wellness brands in the UK. I suffered from anxiety and started creating 100% natural blends to help. They worked! I then followed on with a sleep blend for my sister who was suffering with insomnia, then my husband to boost his energy… when he left the house with 32 bottles for the football team I thought then we may be on to something! There’s so many… my Mum, Sister, best friends, and our customers! How do you juggle family and work life? I have a great husband, Dave, who I tag team with. I couldn’t do it solo! We do 50/50 around the home and with the kids. What advice do you have for starting a business? See if you get traction whilst working your day job first… find a partner with different skills to you and prepare for it to take longer than you think. Hire the best people you can afford as soon as you can. Then… have fun! What are your top wellbeing tips? Create your own wellbeing toolkit – what works for one person won’t work for the next! It’s about finding those few things that you enjoy otherwise it becomes a chore, so whether that’s getting 5 minutes of fresh air at lunch time, meeting with friends, a yoga class once a week or a run; there really are small steps that we can take to feel our best every day. I always see time for myself as necessity not a luxury and it’s a work in progress, but I try not to sweat the small stuff! Whatever your relationship status may be, this Valentine’s Day make sure you take some time out to love yourself… and your skin! Whether you’re single and loving it, o b s e s s e d with your new boyfriend or girlfriend, or planning to dance the funky chicken on your 75th wedding anniversary (per Baz Lurhman’s famous song Everybody’s Free (To Wear Suncreen), February 14th – aka Valentine’s Day – is a day to celebrate love in all forms, and that includes ourselves! We’ve teamed up with the wellbeing experts at Neom Organics to give you the chance to win the ultimate pamper session essential: an Intensive Skin Treatment Candle worth £36.00! A unique. deeply nourishing treatment that’s perfect for all over the body, simply burn your Intensive Skin Treatment Candle for 30 minutes to create a pool of precious oil (just enough time to soak in a warm bath!). Then simply then blow out the candle flame, allow the oil to cool for 2 minutes and drizzle over any part of the body in need of repair and rehydration. Made with 24 essential oils, you’ll be feeling truly pampered in no time! After all, you deserve it. Simply enter below for your chance to win a Neom Intensive Skin Treatment Candle in time for Valentine’s Day! 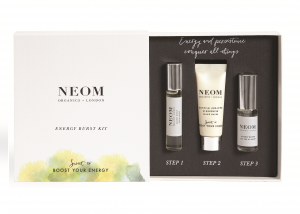 Recharge your beauty routine + WIN £85 worth of Neom goodies! You might be looking forward to an extra hour in bed this weekend thanks to the clocks going back, but here’s three ways to recharge your beauty routine that are better than sleep – yes, really! The clocks go back this Sunday (28th October 2018) but rather than spending an extra hour asleep, we’ll be bounding out of bed thanks to Neom! Their Scent To Boost Your Energy Range is complex blend of 21 first-pressed essential oils such as lemon and basil, purposefully chosen to encourage pure, natural energy. How many of us make time for a bath nowadays? Especially in the morning?! Though delightfully relaxing, baths don’t have to be before bed. Rather than spending an extra hour lounging in bed, try waking up slowly with the Neom Organics Energy Burst Bath & Shower Drops. Catch up on social media, watch an episode of your favourite show, tune into the morning news or finally start reading that book you’ve been meaning to read- you’ll be ready for the day in no time! Everyone loves a face mask, but the Sleep Power Recharge Mask from thisworks is an allbeauty favourite! Designed to recharge and re-energise skin, this bright blue mask helps clear skin and leaves it feeling softer and looking more refreshed. Apply an even layer all over your face and leave for at least 30 minutes. Probably the most skipped part of anyshower routine, exfoliating is super important to prevent dead skin build-up and unclog pores. It’s also a great way to add a little zing in your step in the morning! We love the Grumpy Cow Uplifting Shower Scrub from Cowshed. Made from bamboo scrub particles and with energising ginseng extracts, massge into wet skin to boost circulation and nourish skin. With the days getting shorter and the long nights drawing in, it’s time to embrace the Danish concept of hygge – aka the cosiest feeling ever. But what exactly *is* hygge? And more importantly: how do you say it?! Pure, natural energy: there’s nothing better. But if you’re missing that spring in your step when you wake up in the morning and you rely on stimulants such as coffee, cakes and other sweet treats to get you through the day, chances are that your natural energy supplies are running low. To combat this, Neom have specially formulated their Scent to Boost Your Energy™ range. Made with 100% natural Neom Feel Refreshed™ and Neom Burst of Energy™ fragrances (which smell wonderful and have wellbeing benefits too!) to provide a hit of motivational energy as-and-when you need it, throughout the day. Essential oils are the naturally scented oils extracted from plants. Historically, essential oils have been used in medicine, perfumes, cosmetics and aromatherapy for thousands of years, and date back as far as the Roman Empire. Unlike stimulants such as sugar and caffeine, which can cause headaches, weight gain, affect blood sugar levels and contribute to essential oils offer many health and wellbeing benefits. Take 5 minutes. Spritz the Energy Burst On The Go Mist above you, letting a fresh and energising scent cloud rain down. Breathe in through your nose for 7 seconds and out through your mouth slowly for 11 seconds. To create a more intense energising experience, combine with the Energy Burst Pulse Point. A perky, energising treatment in the palm of your hand. Warm a pea-sized amount of balm between your hands before massaging into the skin. Cup your hands over your nose and mouth and breathe in through your nose for 7 seconds and out through your mouth slowly for 11 seconds. Rich cocoa butter, skin-loving shea butter and 17 invigorating essential oils. Roll the Energy Burst Pulse Point on wrists, temples and behind the ears to activate the intensive blend. At the same time, breathe in through your nose for 7 seconds and out through your mouth slowly for 11 seconds. Finish with a spritz of the Energy Burst On The Go Mist for re-invigoration on the go… Repeat as often as required.